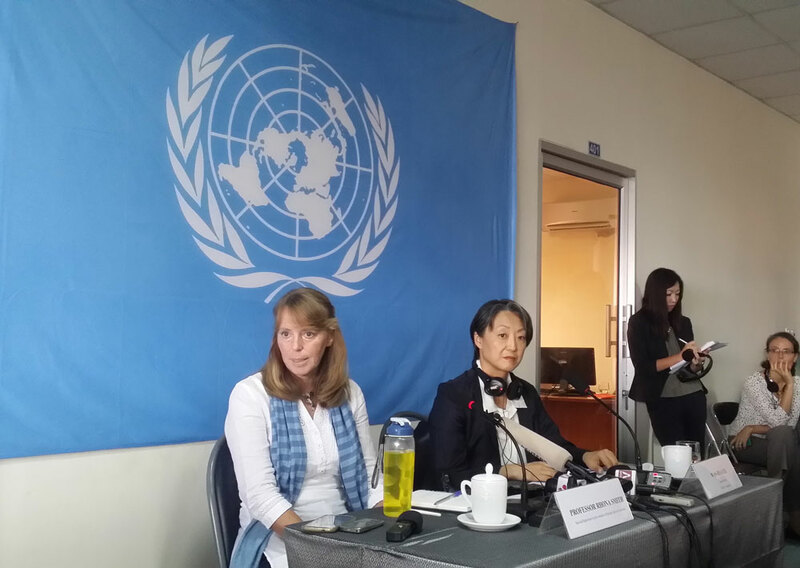 Special Rapporteur Rhona Smith speaks with reporters during a press conference at U.N headquarters in Phnom Penh, Sept. 24, 2015. The new United Nations envoy to Cambodia concluded her first official visit to the country Thursday by calling on Prime Minister Hun Sen’s government to ensure the independence of the judiciary amid a host of land and labor disputes she said are encroaching on the rights of the public. Rhona Smith, a British human rights scholar who assumed the duties of U.N. Special Rapporteur on the situation of human rights in Cambodia in March, praised the recommendations of her predecessor Surya P. Subedi and four other previous envoys, and said improving the country’s judicial system was key to building a vibrant democracy. “Further strengthening the rule of law, developing and ensuring the independence of those bodies with specific roles in the protection of human rights, particularly the judiciary, is essential for building the stable democratic nation that Cambodians aspire to live in,” she said in a statement issued at the end of her nine-day mission. Smith’s recommendations followed a meeting Wednesday with opposition Cambodia National Rescue Party (CNRP) Vice President Kem Sokha, who told her that the country’s human rights problems would never be resolved without reforms to its widely criticized court system. The opposition leader had specifically referenced the case of 11 CNRP members and supporters who were sentenced to up to 20 years in prison each in July on “insurrection” charges stemming from a protest in Phnom Penh that turned violent a year earlier. In her statement Thursday, Smith also warned about the threat of racism affecting the protection of human rights, called for inclusiveness and transparency in lawmaking, and encouraged the continued review of land concessions in Cambodia. In addition to meeting with Hun Sen and officials from his ruling Cambodian People’s Party (CPP), Smith also spoke with members of the opposition, staff from various civil society organizations, and local community members during her fact-finding mission. Smith will report to the 30th session of the U.N. Human Rights Council later this month on the human rights situation. In response to Smith's call for judicial reform, Council of Ministers spokesman Phay Siphan on Thursday told RFA’s Khmer Service that the government had already embarked on such changes. “The government and lawmakers have already worked on reforming the judicial system,” he said. Phay Siphan said the government is working to increase human resources for the court system, including lawyers, prosecutors and judges. He added that France and Japan have also provided experts to assist in judicial reforms, and that Cambodia’s Supreme Magistracy Council has already taken action against corrupt judges. “We are monitoring judges to make sure that the courts comply with the law,” he said. Phay Siphan denied that the jailing of 11 CNRP members and supporters in July was the result of political interference. Also on Thursday, the Cambodian Center for Human Rights (CCHR) marked the 22nd anniversary of Constitution Day and Smith’s first visit to Cambodia by calling for wide reforms in the country. In a briefing note entitled “Cambodia: Democracy Under Threat,” CCHR urged the government to respect the constitution and international human rights law, repeal all “oppressive” legislation, depoliticize the judiciary and military, and put an end to politically motivated arrests and convictions. The group further called on Smith to urge the government to implement recommendations it accepted during the U.N. Human Rights Council’s Universal Periodic Review in 2014. “Democracy in Cambodia is at a crucial crossroads,” CCHR executive director Chak Sopheap said, adding that unconstitutional restrictions of fundamental freedoms had become “increasingly frequent and severe” in recent months, and as elections in 2017 and 2018 draw nearer. “All of these developments are deeply interconnected, and represent a grave threat to democracy and human rights in Cambodia,” he said. Among the recommendations proposed in the briefing note, CCHR urged the government to put a formal end to arbitrary or sweeping bans on the holding of public gatherings. It also called for an end to the judicial harassment of human rights defenders, political activists and opposition politicians, and the immediate and unconditional release of those detained for politically motivated charges or convictions. Reported by Yeang Socheametta for RFA’s Khmer Service. Translated by Samean Yun. Written in English by Joshua Lipes. This time Hun Sen's attitude toward this new UN envoy is different from previous ones. This shows his power is diminishing. Bravo!! Really? Not easy but easy for the corrupt court to come up with trump up charges. Is that right? Again pie in the face said "...the government is working to increase human resources for the court system, including lawyers, prosecutors and judges." You can't work with corrupt lawyers, prosecutors and judges. And this is what Cambodia has. It needs lawyers, prosecutors and judges with their own brain to run the court, not from outside inference. The courts comply with the law? You mean Hun Sen's law, right? Like 11 people who were thrown in jail for exercising their rights.